The most popular photo app company has been hacked they're all 4.6 million Usernames, photos with International Contact numbers by hacker group snapchatdb.info website on New Year. The hacker site has been suspended Due to massive online traffic, but you can still see the information or content on their cached website here. 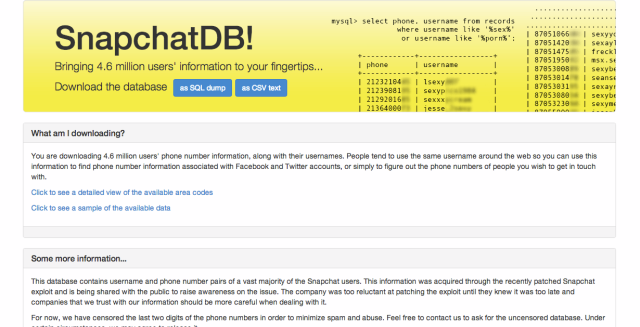 Hackers clearly describe "Bringing 4.6 million users' information to your fingertips"
And It is a really big disaster for snapchat phone application If you want to find out if your Snapchat username is included in the file, visit this username look-up page on Gibson Security here.